The Ganaraska Region Conservation Authority is steeped in a rich history of watershed management and outdoor education. Keeping that tradition in mind, the Authority has recently moved to a more modern approach in reducing our carbon footprint and bringing a natural, non-invasive experience to our visitors in building a brand new facility. 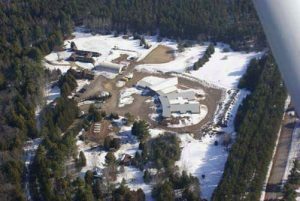 In 2009, the state-of-the art Ganaraska Forest Centre was built on the Ganaraska Forest property. Set in 4,452 hectares (11,000 acres) of the majestic Ganaraska Forest, the facility is a showcase of world class environmental and ecologically friendly design. With 1,580-square meters (17,000-square feet) of barrier-free space, the building features dormitory rooms for up to 80 children as well as two roomy and dedicated Teacher’s Suites that can accommodate up to six chaperones. The Teacher’s Suites are separate, but adjacent to the children’s areas and provide privacy, security and respect for everyone’s personal space. Each suite is outfitted with separate washroom and shower facilities, its own phone line and WiFi access. The building features a 222-square-meter (2,400-square feet) Great Hall with a beautiful stone fireplace; a cozy gathering place where residential groups share meals and learn fun ways to lower their own impact on the environment. 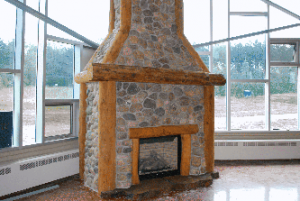 As well, there are two other, dedicated classroom spaces for break-out sessions, the Learning Gallery, Mudroom, an administration area, the Oak Ridges Moraine Information Centre and a Resource Room dedicated to the identification, habitat and adaptation of flora and fauna native to the Ganaraska Forest and surrounding areas. The Ganaraska Forest Outdoor Education Centre also houses a full-service commercial kitchen, staffed by certified culinary professionals who offer a healthy and adaptable menu to suit special dietary concerns. The new Ganaraska Forest Centre is a multi-use facility that adheres to a LEED (Leadership in Energy and Environmental Design) system of construction and incorporates environmentally friendly wood species, green roof areas, solar energy, recycled roof tiles and other materials made of recycled rubber, wood and ceramics; all in an effort to demonstrate our leadership in solid conservation strategies.See a description of the Environmental Features.